Studebaker and Byers A. Burlingame. 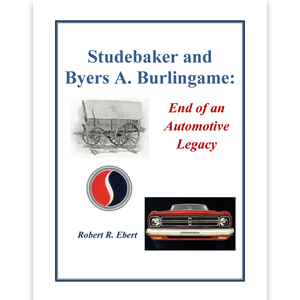 Using corporate documents and photographs, this book examines the last three years of the production of automobiles by the Studebaker Corporation under the leadership of Byers Burlingame. From the closing of the South Bend plants in 1963 to the end of auto production at the Hamilton, Ontario plant in March 1966, the company’s decisions are analyzed from economic, management, and marketing perspectives.